Water damage cleanup is a messy, involved process. It requires a lot more than pumping out the water and airing out your home. Sure, you may be able to handle small leaks or spills on your own, but when it comes to real, serious water damage getting the job done right requires contacting the pros. At Courtesy Care in the Springdale area, our certified technicians have the experience and skill necessary to restore your home back to its original state after a water damage event. Don’t hesitate to call! Every minute you wait to seek out help after a flood increases the amount of damage done by the water, the amount of mold growth, and your repair expenses. Below are the three main ways in which a professional cleaning and restoration contractor will be able to help you in ways you won’t be able to do for yourself. 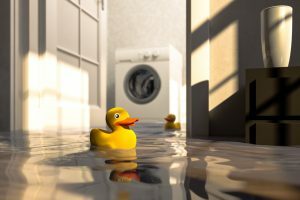 One of the biggest mistakes you can make after a flood is immediately jumping into the cleanup process. Hidden within floodwater are many potential dangers. Often, these dangers include exposed electrical wires, toxic chemicals, and sewage. Furthermore, a flood may have weakened the structural integrity of your home making it unsafe for you to be there. To be safe, you should always have your home professionally inspected after a flood. A mop and bucket are of limited help when you’re looking at flooding or other serious water damage. A submersible pump can do in a matter of minutes what it might take you all day to accomplish. High-efficiency blowers and industrial fans dry the area much more quickly than the simple box fan you own. Could you benefit from industrial equipment such as a trailer mounted dehumidifiers, gale force air movers, and additional industrial-sized generators? Few homeowners have access to portable air scrubbers to control mold. Using specialized equipment such as negative air machines and portable heaters will help you lessen damage and get you back to your space quickly. A professional cleanup service has the equipment needed to resolve the problem quickly and thoroughly. Water damage cleanup requires a high amount of attention to detail. Missing any points of moisture throughout the home can lead to mold growth. Over time, this water can seep into your walls and cause mold to begin growing within your walls. This can become a serious problem as a mold of this sort is very difficult to remove. A professional cleaning and restoration company will be able to remove all the water on the first attempt preventing this from ever occurring. We hope you will never have the need to call due to a water damage disaster, but if you ever do there should be as little hesitation as possible. Our pros at Courtesy Care are always ready to respond and restore your home. With the decreased risk to your health, industrial equipment, and superior attention to detail we or any cleaning and restoration contractor can offer you can rest easy knowing that your home is in good hands.